SAN FRANCISCO – The San Francisco Giants went streaking this weekend, winning three straight games against the Colorado Rockies. 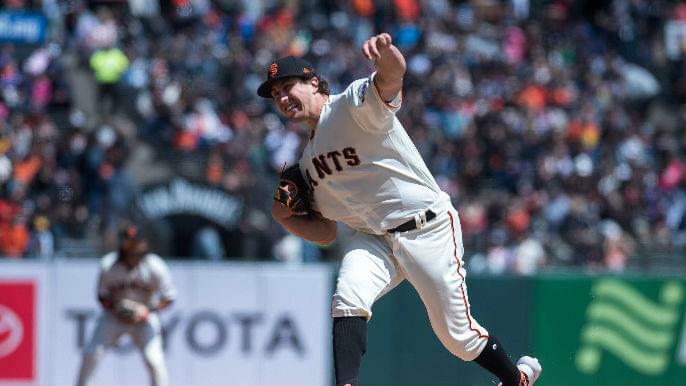 The Giants entered Sunday’s contest with a chance to sweep the struggling Colorado Rockies behind lefty Derek Holland. Failing to put away the Rockies for the fourth straight game, the sweep would fail to materialize as the Giants bats go ice-cold at the hands of the German Marquez’s near no-hitter. The first two innings of this ballgame were quiet, with little action offensively for both teams. Giants starter Holland surrendered the first run of the game in the top of the third, following a Nolan Arenado walk, who then came around to score on a Trevor Story RBI-double to left giving the Rockies an early 1-0 lead. Early on, Holland was productive but had to battle his way through the first four innings, throwing 74 pitches but striking out five batters. Holland’s struggles continued in the top of the fifth. With one out, Charlie Blackmon lined a single off the glove of Brandon Crawford at short. Garrett Hampson would follow with a base hit of his own to put two runners on for Arenado. Struggling offensively this season, Arenado had yet to homer, before his frustrations at the plate would end, launching a three-run homer to left. Able to get through six innings, Holland’s day would conclude after throwing 101 pitches. Giving up four runs on just four hits, Holland battled through six, despite not having his best stuff. Through five innings the Giants were without a hit and a baserunner against Marquez. Kevin Pillar broke up the perfect game in the bottom of the sixth after getting hit by a pitch, as the Giants remained hitless. Marquez’s no-hitter would continue through seven before finally coming to an end in the bottom of the eighth on a single by Evan Longoria. The ninth inning came and went quietly as the Giants were shut-out on a complete-game performance by Marquez. Winning three straight, the Giants streak came to a halt Sunday. Holland put up a good fight against the Rockies, but ultimately sank the Giants chances after surrendering the three-run homer to Arenado. The winning pitcher is German Marquez, the losing pitcher is Holland (1-2, 4.09 ERA). The Giants have an off day Monday as they travel to Washington to face Stephen Strasburg and the Nationals.